How much speed you need depends on your answers. There’s no single “best speed” when it comes to internet service, which is why choosing a plan can be confusing. The speeds that work fine for your neighbor might not be even close to what your household needs, since there are many factors to consider and differences in how people use the internet. Before we get to the questions, let’s review the meaning of bandwidth and how it relates to internet speed. Bandwidth refers to the amount of data that can be transferred over an internet connection per second. It’s usually measured in Mbps (megabits per second), and every internet plan has a specified maximum bandwidth, such as 50 Mbps or 100 Mbps. This bandwidth is shared by all the users and connected devices in a household. It may be helpful to think of bandwidth as a highway with vehicles traveling on it; the highway is the internet connection and the vehicles are the data. The wider the highway, the more vehicles can travel on it at one time and the faster they get to their destinations. The same principle applies to data — the more bandwidth, the more information that can be transferred within a given amount of time. What are your current download and upload speeds? Download speed is the speed at which you can get information from the web to your device. Upload speed is the speed at which you can send information from your device to the web. You can test your internet speed for free at www.speedtest.net. That way, you’ll know where you are now with your internet connection. How many internet-connected devices do you have in your home? The more devices you have, the more bandwidth/speed you need. Since bandwidth is shared by every user and device connected to your home network, multiple online demands going on simultaneously will require an internet plan with speeds at the higher end of the spectrum. Remember, even background processes like software updates use your bandwidth. If you only have a desktop computer that’s used to check email and surf the net, then a relatively slower internet connection (such as 10 Mbps) may suffice. However, if you have a family of several people simultaneously using your internet connection for data-intensive activities — such as streaming HD video and music, online gaming, sharing photos and videos online, video chat, and cloud storage — then you’re probably going to be happiest with speeds in roughly the 50-100+ Mbps range. What are your internet performance expectations? Let’s say you only occasionally watch videos online. In this case, you may be willing to tolerate slow load times and buffering. But if streaming HD movies is a cherished part of your routine, you’ll be frustrated by slow speeds and the annoying lag that comes with them. Make sure the internet speed you choose is in line with the value you place on internet performance quality. Do family members or houseguests complain about your internet connection? If your answer to this question is “Yes,” it’s a sign that you might need more bandwidth/speed. However, it’s important to note that other factors can also negatively impact your internet performance. For example, if your wireless router is outdated, you may not be getting the speed you expect from your plan. Some older routers have a speed cap limiting the maximum internet speed possible. Replacing your router may be all that’s necessary to get the speed you need to keep everybody happy. Your wireless router is in the wrong location. Keep your router centrally located and away from thick walls made of brick or concrete, water, and windows. Neighbors are using your Wi-Fi. Putting a password on your router or limiting which devices can access your network will keep other people from using your network and slowing it down. Your computer is infected with a virus. This can make your internet connection appear to be sluggish, when in reality, it’s a computer issue. Run a virus scan and if a virus is detected, follow the instructions. Given the importance of the internet to so many activities, it’s worth taking the time to find exactly the right plan for you. 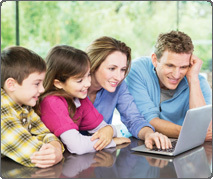 Granite State Communications offers a range of internet plans with varying speeds to match the requirements of different households. You can get information on our internet services online by visiting our Internet Services page. Better yet, call our Customer Care team Monday – Friday, 8 am to 5:00 pm, and get their advice on which internet plan might work best for you. Customer Care representatives have experience helping many customers and can make suggestions on what might work best for you based on your location, devices, users, online activities, and home network setup. © 2019 Cornerstone Publishing Group, Inc.